One of the biggest missing pieces in Google is music search. While it is possible to limit your searches to audio files by using the filetype operator, not only is it inconvenient, but it's also hard to tell what the file actually contains. This is where a new service called SkreemR steps in. It specifically lets you search for MP3 files and displays the metadata associated with them so you can tell whether you're downloading the latest Beyonce single or a Mozart symphony. You can find music by bitrate, length, artist, genre, and album in addition to title. One neat SkreemR feature is the built-in music player that lets you preview a song before downloading it. It's also interesting that you can rate search results. This might come in handy for filtering out junk audio files. Another music search engine that's worth a look is MP3Realm, which has mostly the same features, but a plainer interface. The search result in skreemr is not 100% accurate all the time. Sometimes its very difficult to download songs from this site. 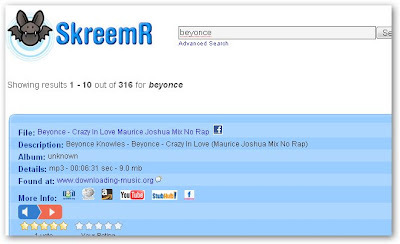 So i recommand http://www.woonz.com for searching and downloading song. It's a complete mp3 search engine. user can listen to online or can download from this site. it's really amazing. U guyz can give a look in to it. U will love it! woonz.com rocks!